The magician displays a spinning spiral. The audience is asked to stare at the spiral while the magician counts backwards from ten to one. When the audience looks at the magician, his head appears to inflate like a balloon! A spectator is brought on stage and the process is repeated. Now when the audience looks at the spectator, his head shrinks and deflates! The Growing and Shrinking Head Illusion has become a classic in magic. Magicians from part timers to professionals have made this illusion a staple of their shows. Through the years, we have had requests to make a bigger sized spiral for large theaters and stadiums. Well there were a few things we had to work out. We have, and now the large size is finally available. 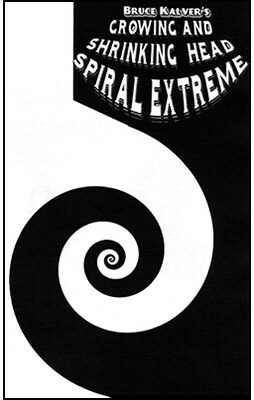 The photo shows the relative size difference between the original spiral and the new EXTREME EDITION. This spiral is much larger than our regular spiral: a whopping 24 inches! Made of super light weight corrugated plastic. With care, this prop should last a long time. To make it spin, we have found the perfect cordless drill that acts as a stand for the trick. You can buy the drill (sold separately) at your local department store. We even figured out how to keep the spiral running without the need to keep your finger on the drill button. A corrugated artist sleeve to carry the spiral to your shows. A special strap to keep the drill running without having to press the trigger. The proper hardware to attach the spiral to the drill. Printed instructions which includes Bruce Kalver's tips and hints to get the maximum reaction. PLEASE NOTE: This spiral will need a minimum of 15-20 feet of distance between the performer and the audience to work. PERFECT FOR VERY LARGE THEATERS, STADIUMS , ETC.